This is the latest of our 2017 team previews. Each week during spring training, we’ll preview a division with a team each day (Monday-Friday). Last week: AL East: Boston Red Sox | Toronto Blue Jays | Baltimore Orioles | New York Yankees | Tampa Bay Rays. Up next: New York Mets. 1. Trea returns to six: Out of necessity last season, Rookie-of-the-Year runner-up Trea Turner played outfield and second base but will move back to his natural position of shortstop for the 2017 campaign. The various fielding assignments didn’t faze him at the plate: the 24-year-old slashed .342/.370/.567 over 324 at-bats with 13 homers, plus he swiped 33 bases. Some regression is due but Turner should be busy on the base paths with Daniel Murphy, Bryce Harper and Anthony Rendon batting behind him. 2. 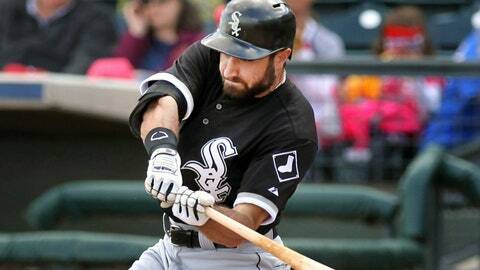 Trading tomorrow for today: After sniffing the NLCS, Nationals brass decided to go full throttle in 2017 by trading top pitching prospects, righties Giolito, Lopez and Dane Dunning for center fielder Adam Eaton of the White Sox. Eaton is a fine player under a reasonable contract but Giolito is the team’s top pitching prospect so this trade could look awfully lopsided one day even if Eaton carries his weight. 3. 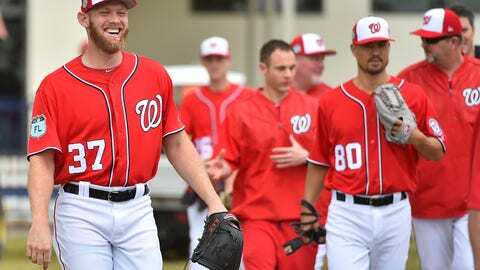 Good health permitting: The Nationals have a solid pitching staff led by 2016 NL Cy Young winner Max Scherzer and Stephen Strasburg but both may enter the season with health concerns. 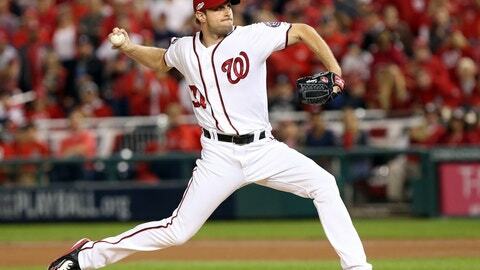 Scherzer is recovering from a stress fracture in his knuckle (not too worrisome) while Strasburg is working his way back from a partial tendon tear in his right elbow that sidelined him in early September. If those two are OK, great, but ideally Tanner Roark, Gio Gonzalez and Joe Ross is the rotation’s 3-4-5 and not 1-2-3. This team is pretty stacked. 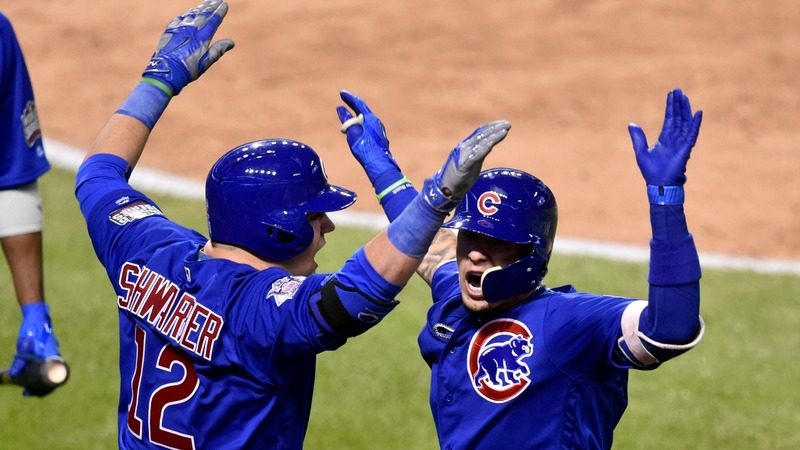 It can challenge anyone, including the Cubs, to represent the NL in the World Series and win it. 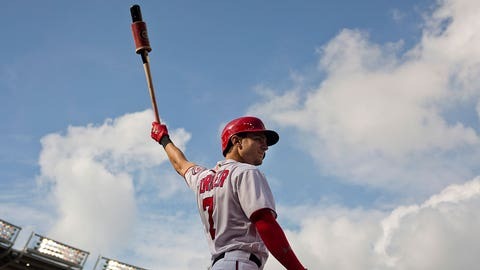 Strasburg gets shut down again with a right elbow ailment, Ryan Zimmerman falls apart at first base and his replacement Adam Lind isn’t much better, Bryce Harper has another “down” year (a career year for most everyone else) and the Nationals go one-and-done in the playoffs again. Harper’s down year saw him bat a career-worst by far at .243 but his on-base percentage was second best in his five MLB seasons (.373) thanks to his NL-leading walk rate (.172), or 108 free passes in 627 plate appearances. 1. 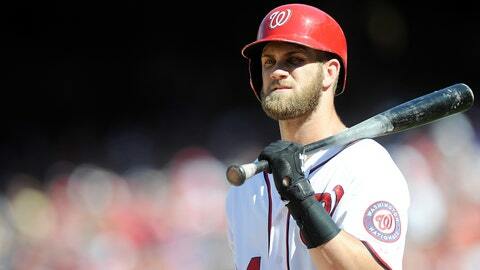 Bryce Harper – His .243 batting average last season was a fluke. He’ll return to a .280+ hitter with plenty of power stats to justify his first-round average draft position. 2. Trea Turner – The 23-year-old prospect swiped 33 bases in just 73 games last season. Plus, his 2B/OF position eligibility only strengthens his fantasy appeal. 3. Max Scherzer – He’s averaged more than 10 strikeouts per nine innings pitched for five consecutive seasons. 4. Stephen Strasburg – Started the 2016 season 13-0 with a 2.51 ERA, but missed the end of the season with a torn elbow tendon. He is cleared for spring training. 5. Daniel Murphy – The 1B/2B-eligible Murphy posted career-best marks in homers (25), RBI (104) and batting average (.347). Some offensive regression is expected. National League runner-up to the Chicago Cubs.